SNES Out to Lunch (USA) in 14:38.74 by Alyosha. 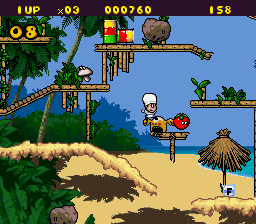 Out to Lunch is a little-known, very fast-paced platforming game where you play as a chef whose food has escaped and your goal is to recapture the food items from around the world. However, this is difficult due to strict time limits, a small amount of lives, and tough enemies that can either kill you or infect the food and turn it against you. Thanks to much better optimization, Alyosha beats one of the oldest previously unobsoleted runs by over a minute.